I am Sally Chappell, a mature Lady golfer. I live in Leeds England, and have been a member of Rawdon Golf and Lawn Tennis club for 14 years. My handicap is 26, which I consider not bad as our course is a very challenging one, hilly with lots of trees. 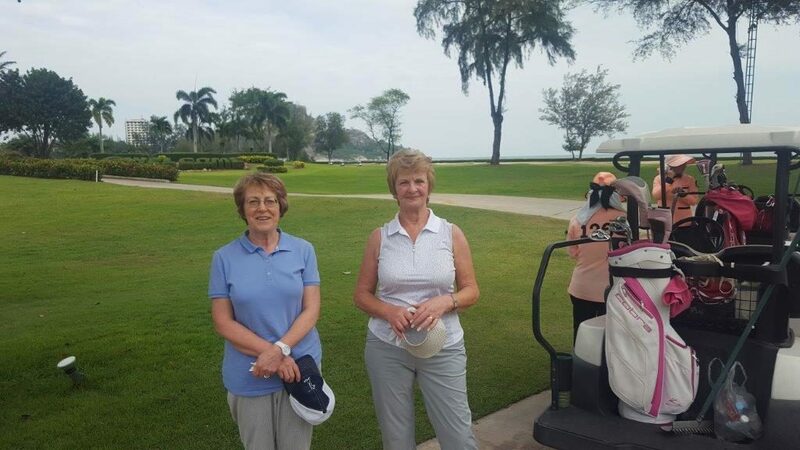 My friend Elizabeth Leach and I have played golf in Florida, Portugal, Turkey and Cyprus, and this year decided we would like a trip away in January, so Thailand seemed to be the ideal place for some good weather. How right we were, the sun shone for the whole two weeks which enabled us to play golf in ideal conditions. 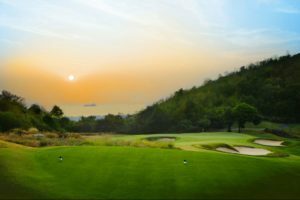 We were recommended by a friend to book with Golfasian, and Ian Morgan organised everything to our requirements with perfection. We travelled with Emirate airlines via Dubai and unfortunately our journey out was delayed by 8 hours. We were a little apprehensive that would cause a problem with the transportation from Bangkok, but the worry was unfounded as the delightful, friendly driver was waiting for us when we arrived. Our stay at the Laksasubha hotel was everything we had hoped; beautiful rooms, extremely friendly, happy staff, and a delicious breakfast every day served almost on the beach. We looked forward to the new experience of having a caddie and were definitely not disappointed. Our first round was at Sea Pines, a very picturesque course, particularly the holes around the bay. The game at Springfield Country Club was so enjoyable, made so by the very friendly, efficient and fun loving caddies. Pressure was definitely on us as far as the golf was concerned when Elizabeth and I realised our caddies were betting on our play, 10 baht per hole! My favourite course was Banyan, probably because I got a birdie on the par 3 4th hole. Every evening began with cocktails (of course) in the hotel bar on the beach, then we ate at various restaurants in the town. Two days left of our holiday and we were told about Svensons Ice Cream Parlour, very fortunate we didn’t hear about it at the beginning of our stay, otherwise we would have had to buy bigger clothes. We both thoroughly enjoyed our golf holiday in Thailand. 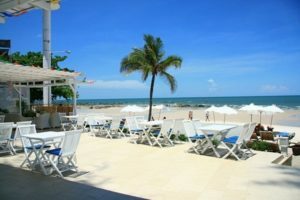 Hua Hin is a very relaxing resort destination, and we both felt safe wherever we walked. We have returned home with lots of very happy memories, thanks to Ian Morgan and his staff at Golfasian.